Watched The Motorcycle Diaries tonight, yeah I know I am always on the cutting edge. I still haven't seen The Matrix. Anyway, I LOVED it just like most everyone else. And my gawd he was hot. And so is the actor that played him. Yum. Tomorrow is date number three. Yum. I am definitely going to get the camera out so I can share the hotness that has entered my world. Everything is coming up hot apparently. 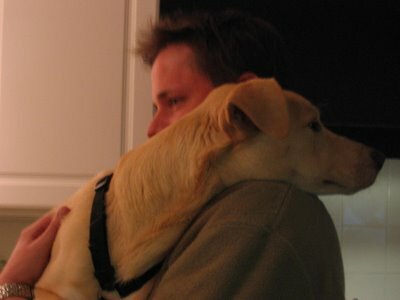 *Above picture is my brother and my "lap dog". posted by Robin Alexa at 9:36 p.m.